​We are offering up our latest Starsight build for testing though much work remains to be done. Click on 'Join In' in the navigation bar to join our discussion group and be given access. This build does not yet support the latest Oculus drivers/headset but a new one is in development. Check out our most recent blog post for an update. Frustrated by cloudy skies or bright street lights? Have you ever seen the Milky Way from where you live? Interested in the stars but don't know where to start? Now you can see the starry sky all around you, from the comfort of your own home, and even have an astronomer show you around. Right now we have a working prototype... watch this space! We have always been fans of the open source planetarium software Stellarium. When the virtual reality headset Oculus Rift came along, we saw an opportunity to make an immersive stargazing experience widely available. We got hold of the Oculus Rift development kit, and adapted the Stellarium software to speak to it. Stellarium is completely open source, and our variant will be too. Then anybody who has an Oculus Rift headset will be able to enjoy the 360 degree sky. The consumer version of the Oculus Rift headset should be available in 2016. What we really want to do is to show people the wonders of the sky in a live presenter-led event, much like you would get by attending a planetarium show, but over the internet. Our software can work in 'linked' mode. Here, you would connect to a Starsight server at the advertised time. The presenter controls the configuration of Stellarium - date, location, speed of sky, constellation lines etc - and picks objects to look at. You are free to look around, with arrows to guide you, and listen to the presenter over an audio link. Do I need the Oculus Rift headset to join in? No - you will still be able to join the astronomer-led show, viewing the sky on your computer-screen instead. But you will get the full immersive grooviness if you do have the headset. Not quite! We have a list of improvements and enhancements we want to make but you can now access our latest build for testing. We hope to have a new build available for testing before the end of February 2017. All being well, this should work with the latest Oculus drivers and headset. We are also exploring support for the HTC Vive too. When the new build is ready we are going to begin testing our first scheduled online Starsight events. This may involve anything from technical testing, to flag up any potential problems, to full-blown stargazing talks. The internet shows will rely completely on volunteer effort, so we'll likely need some help! 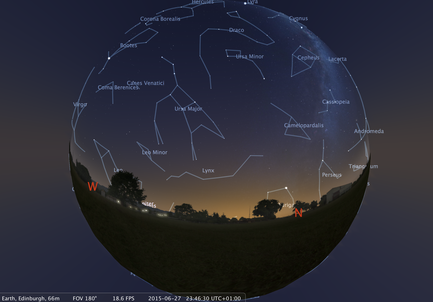 Stellarium screenshot. You won't see this wide an angle in the Oculus Rift, but its a nice pretty picture! The StarsightVR project has been carried out by students and staff at the Royal Observatory in Edinburgh, led by Alastair Bruce and Andy Lawrence, with the software written and adapted by Guillaume Chereau from Noctua Software. The initial work was funded by a grant from the Science and Technologies Facilities Council, but is now run on a volunteer basis. We also received some funds from our Crowdfunder last year. The work will be supported through the Royal Observatory Edinburgh Trust, so please do visit that page to learn more about the Trust where you can also donate to the project if you wish. Many thanks!